Well, 2018, you've been an interesting year. You were certainly better to us than 2017, but that one wasn't hard to top at all. Sonia and I are loving life on the open road so far, and 2019 will be our first full year of nomadic living. Bring it on. We found this fun bag of gimmicky gummies at a Trader Joe's in Austin, Texas. 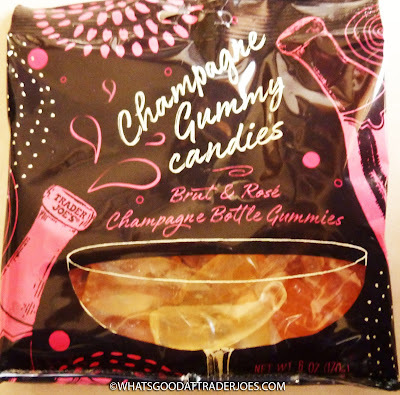 I don't think it ever would have occurred to me in a thousand years to turn champagne into gummy candy. But fortunately—or unfortunately, depending on how you look at it—somebody did. Each candy is shaped like a champagne bottle. Imagine that. Sonia thinks they resemble...well, I won't tell you what she said about their suggestive shape on this family-friendly blog. Just suffice it to say that I had to tell her to get her mind out of the gutter. Although, well, she kinda has a point. The flavors are very subtle. There's rosé and brut. I want to say I can detect the difference between the two, but I wouldn't want to put money on guessing which was which in a blind taste test. They're not overly sweet or sour or flavorful. I suppose champagne is supposed to have a "dry" taste and feel to it. These do too in a way, although the dryness of champagne doesn't really lend itself to gummy candy particularly well, in my opinion. And there is actual champagne in there—but all the alcohol is burned off in the manufacturing process. 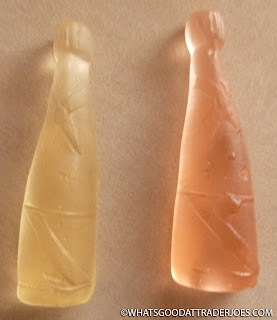 I'm guessing if you were inclined to pair a gummy candy with a glass of actual champagne for some reason, this would be the product to reach for. Texture-wise, Sonia and I both found the candy to be somewhat leathery. 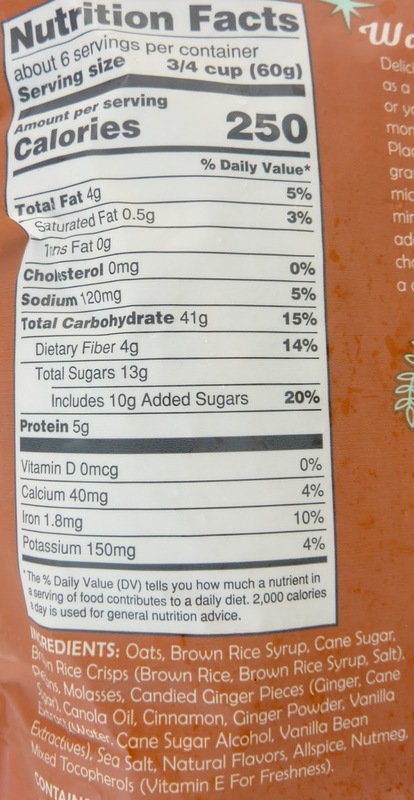 The "best by" date on our bag is in 2020, so it's not like they should be stale. It's an odd mouthfeel. There's no melt-in-your-mouth quality here at all. They require a tad too much masticating, if you ask us. Sonia thinks they might even pose a choking hazard, since they're "slippery" as well as overly-chewy. If you're too cheap to spring for an actual bottle of champagne, you could probably skate by with this $2 bag of clever candies as your contribution to the NYE party refreshments. As long as people are on their way to Happy Town, they likely won't even notice that these gummies aren't that good. Meh. They're not that bad, either, I guess. Well, there's an easy headline, right? I wish I were more familiar with takis, to be honest. But I'm not. And to write this review, I thought I'd track some down and make a side to side comparison, as would only be right. 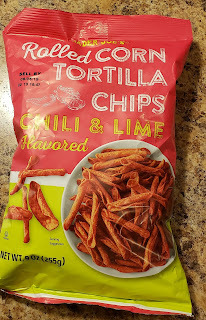 But Christmas and a slow moving stomach bug happened, and there's deadlines to meet and an audience which I can only feebly attempt to appease in my current state, so here we go, a review straight on of Trader Joe's Rolled Corn Tortilla Chips - Chili & Lime Flavored. There's no other way to say it: these TJ takis might be the most potently flavored item I've ever tried from TJ's. From the first bite, they do not mess around one bit. Holy smokes, wow. Most chili lime seasonings are kinda subtle, with maybe a little touch of lime or heat. That's so not the case here. Some of the chips stray more towards lime, whereas others are more chili-fied, but both flavors smack around your tastebuds and leave you begging for mercy. You have to love lime to like these - imagine the citrusy sourness of a bag of Sour Patch Kids being condensed down to a small handful of chips, with no sugary balance to sweeten things out after the inital touch. That's what these rolly pollies are like. Except them there's decent, smoky chili spiciness that then comes in. My tongue was so discombobulated after all the lime that it was tough to discern if it was more or less than a typical chili chip. I'd say the chips stray a lot more towards lime than chili, Sandy says it depends on the chip. But whichever way it tilts, be assured: it'll pack a punch. Add to all this the super crunchiness of a crisply rolled tortilla chip. There's so many layers of crunch! It's fun! No wonder people love takis. These TJ's ones aren't terribly greasy or anything aside from being a little messy from all the seasoning. 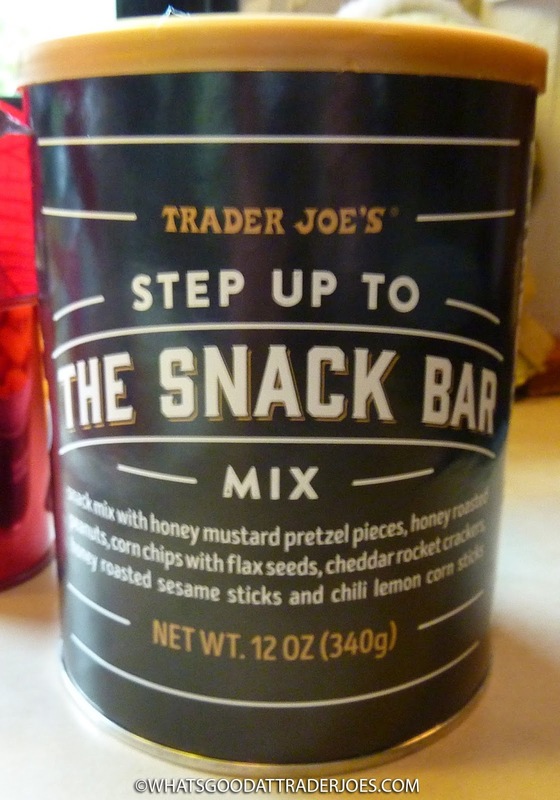 Super snacky until the flavor overwhelms you. I'm hoping these rolled chips will become a staple at TJ's. I want more flavors too - a cinnamon and sugar one would be FANTASTIC. I'd buy those by the case, and I'm tempted to do that here as well. Really, no complaints. I'm impressed, really, as is Sandy. Really darn good all the way around. Ah, gingerbread. This product looks festive and has a gingerbread man-shaped, see-through window on the packaging. A product worthy of a Christmas Eve Day blog post, no doubt. Let's dive right in. I'm not sure if I'm the odd man out here, but I don't recall having gingerbread much as a kid. No gingerbread cookies or actual gingerbread men. 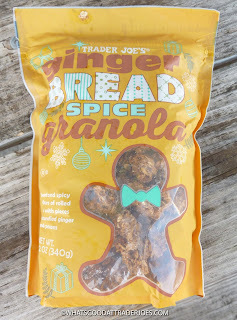 Certainly no gingerbread cereal. I feel like gingerbread may have been more European, or perhaps just characteristic of older generations. Maybe late Gen X'ers were too spoiled by tooth-rotting sugar cookies and chocolate to honor the natural zing of ginger. I'm trying to appreciate it more and more in my old age, especially since ginger provides a long laundry list of health benefits. Now, we've definitely seen Trader Joe's overdo the ginger in the past. Another granola cereal comes to mind as far as that goes. Of course, there are plenty of you out there that crave those blasts of raw ginger. And plenty of you who don't. Each to his own, right? Then one foggy Christmas Eve, Nathan came to say: this product has the best balance of actual ginger flavor and brown sugary sweetness that we've seen from TJ's to date...at least in cerealized form. Sonia gobbled it down faster than any other cereal in recent memory. 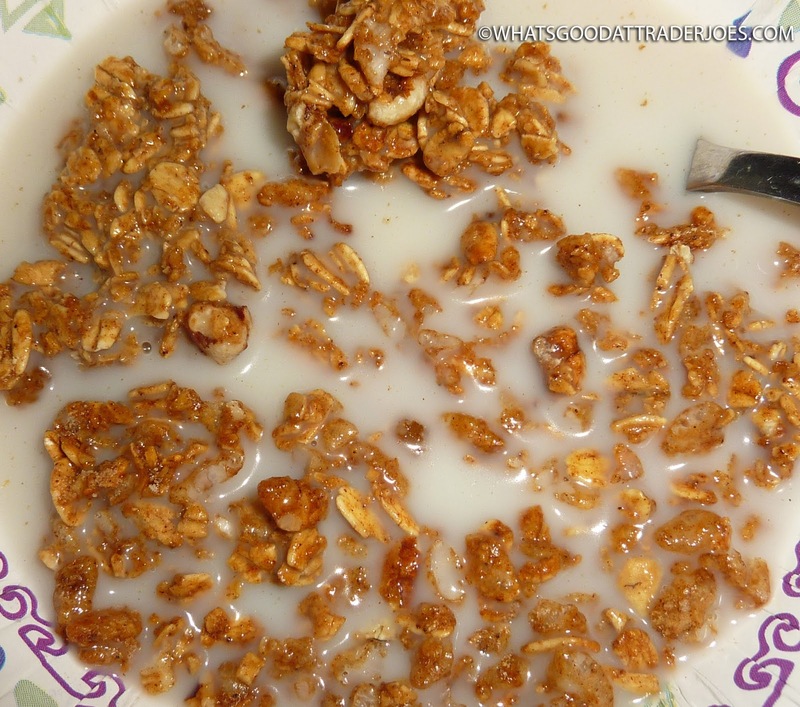 Usually she lets her cereal soggify well beyond any reasonable duration of time, allowing the crunchy bits to deteriorate into a porridge-like consistency, treating all crispy and crunchy cereals more like cold oatmeals. Not sure why. This one, I'm pretty sure there was still some crunch left in the granola when she finished her bowl. That's a testament to how much she appreciated it. I liked it, too. The ingredients are top quality, and make sense for a semi-indulgent breakfast treat. Oats, brown rice syrup, cane sugar, pecans, candied ginger, cinnamon, just to name a few. We haven't tried it warm yet, but I'm sure it's just as good. Nor have we tried it as a yogurt-topper or anything similarly adventurous. We've just been having it for breakfast every day now for about three days in a row and are just about to polish off the bag. Maybe next year we'll prepare it a different way...if we're not overwhelmed with another batch of brand new TJ's Christmas goodies. Four Christmas stars from the missus and three and a half Christmas stars from me. Merry Christmas to all, and to all a good bite! Excuse us please. We've been drowning in cookies. Sandy and I got cookies like Scrooge McDuck got coins. We've been swimming in them after a recent holiday cookie potluck we hosted...and there's no end in sight with family coming in next week for Christmas. My mom can't stand the thought of anyone not having a 55 gallon drum full of at least three of their favorite cookies. So even though TJ's typically shines this year for all sorts of holiday goodies, we've avoided the super Christmassy sugary stuff out there. our bad. A lot seems to be recycled from years past, so almost undoubtedly we've covered if you did a search here. So how about another kinda treat you might see at a holiday function...like Trader Joe's Chianti Red Wine Artisan Salami. Gimli said it best, really. Salted pork. So tough to beat. 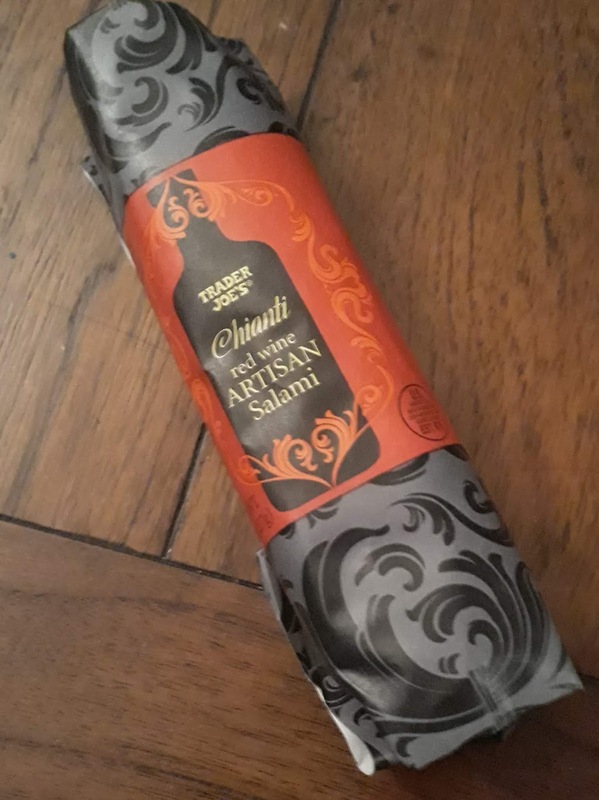 And there's something to be said for a good quality salami, with bonus points for not having to behead any urakhai to get some. I'd classify the TJ's red wine salami as such. "Artisan" might be more embellished marketing than actual fact, but no matter. The meat is how one may expect - a little greasy, a little gristly, with the pepperoni-esque collagen wrapper to remove before eating. The taste really is almost equal parts smoky and salty, with a little sweetness coming from roasted garlic and/or the red wine powder. The red wine is definitely noticeable and pleasant, and lends almost a certain "lightness" to the overall flavor. For myself, I appreciated the overall softer bite. Not to say the meat isn't firm - it certainly is. But other similar meats I feel are more gnaw than chew, and that's not the case here. It helps it all go down a little easier. And as I can presently (as of time of writing) attest to, the salmai pais well with a little bourbon. But put it on a cracker, get a sharp cheddar or smoked gouda...that'd be good. Really good. Holiday charcuterie board worthy good. And naturally, as it is a wine-based product, some adult-style grape juice just might work with it too. One more pop culture reference, as I can't think of how else to work it in but I must: one of my favorite Family Guy moments ever. At least be thankful I didn't try to make a "Red Red Wine" parody...I came up with a few lines but it started sounding way too suggestive in a route I did not wish to take way too quickly. But yes, red red wine can make a meat so fine. Who knew? And at a respectable $4.99 price tag as well. Double fours from the wife and me. Disclaimer: Due to health concerns, Sonia and I have been eating markedly less salt lately, and it's possible—just possible—that our unusually high level of appreciation for this product may be, in part, due to the fact that it's one of the first super salty snacks we've really indulged in since Thanksgiving. 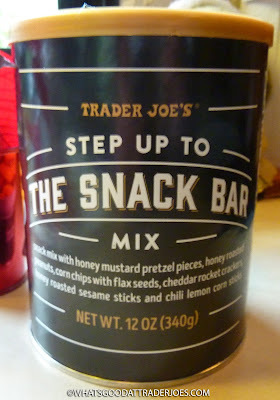 In our opinions, if you're gonna reach for a salty snack at TJ's this holiday season, this isn't a bad mix to consider. The honey roasted peanuts. Over the course of a five hour flight as a kid, I'd eat like 12 bags of those things on an airplane. They weren't as pricey back then, and the airlines seemed to be much more generous with them. They've grown stingy over the years. I'm always like, "I just paid $500 for this flight. The least you can do is give up an extra bag of honey roasted peanuts, right? Sheesh." But anyway, back then, I was a cute kid with a full head of light blond hair. I'd flirt with the stewardesses and ask sweetly for more bags. How could they say no? I'm apparently not as cute as an old, bald man with a devil goatee...but I digress. The point is I loved honey roasted peanuts so much back then, but my love for them has dwindled somewhat in recent decades. 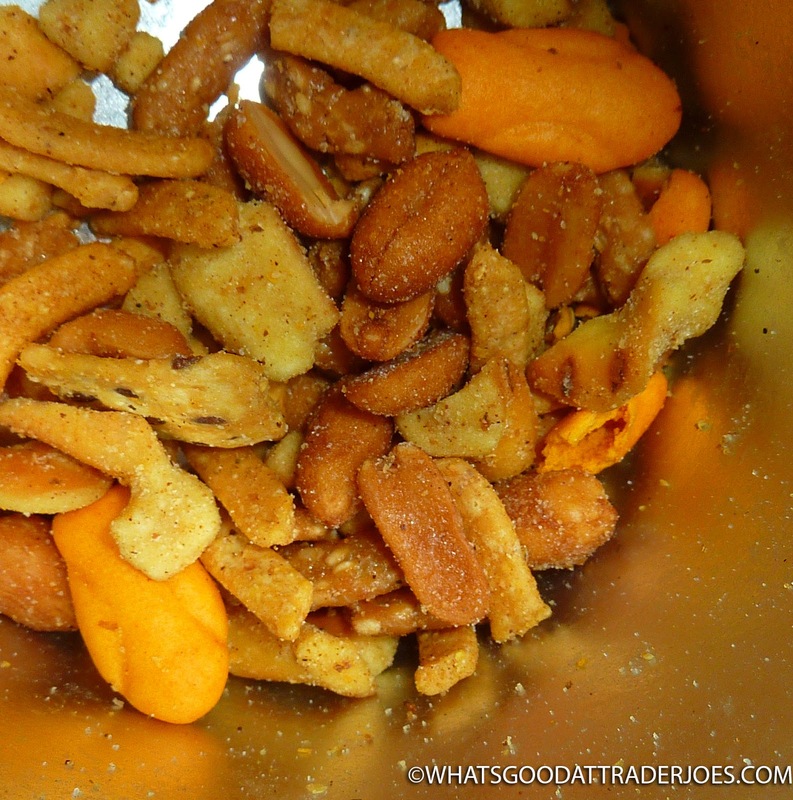 Not sure why, but this mix rekindled my love of honey roasted peanuts. Maybe they were just that good. Maybe it was the combo of the nuts with the other elements of the mix. Or maybe it was just me taking a break from my lower sodium diet. But these were some tasty peanuts, and Sonia totally agrees. Corn chips with flax seeds. Not my favorite, but certainly not bad. I've had snack mixes that were loaded with weird crunchy sticks with sesame seeds. 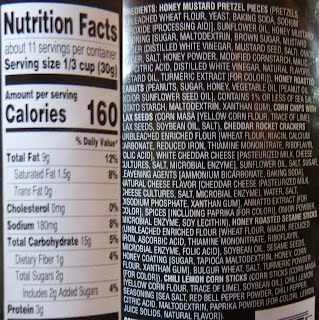 I have no problem with sesame seeds, but sometimes they're just out of place and they ruin the flavor of the foods they're mixed in with. 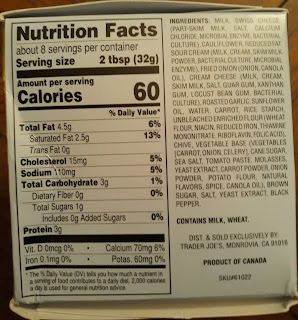 For that reason, I'm glad TJ's went with flax seeds here. Their taste is less intrusive, if that makes sense. They're hearty and earthy and they blend in just fine without overshadowing the other flavors. Cheddar rockets. 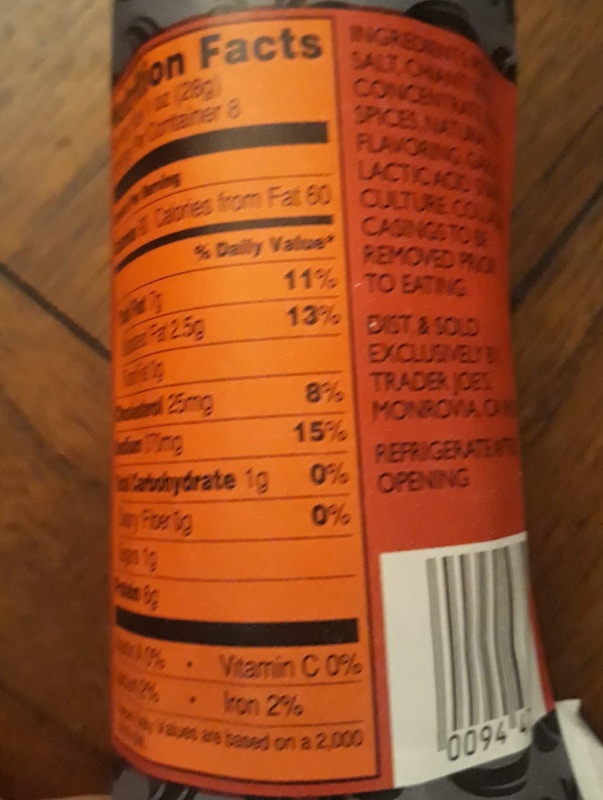 Apparently, Trader Joe's sells these as a stand-alone product. We've never reviewed them on this blog, but we have taken a look at their cheddary Christmas cousins. Sonia thinks there are too many rockets in the mix. I didn't mind them. They have a nice genuine cheddar flavor. I didn't enjoy them quite as much as the pretzels or peanuts, but I definitely appreciated them more than the corn and flax dealies. Chili lemon corn sticks. There's just enough chili to give them a subtle kick, but not quite enough to scare off spice-o-phobes. There's a vague citrus vibe here, no doubt from the lemon, but it's also very similar to anything chili-lime flavored or coated in chili lime seasoning. The citrus-chili-corn combo is a winner almost every time. Again, they mix well with the sweeter elements and provide a bit of a spicy zing. The whole thing is modeled after a bar or pub mix, and indeed, it does pair well with lager or ale. Whether you indiscriminately shovel handfuls into your mouth or you pick out your favorite elements and create particular flavor combos, it's all good here. $5 for a 12oz can. Might be a repeat purchase for us. Is this even a holiday product? I don't think we've seen it at TJ's before this month. Hopefully it'll be available year round. Four stars from Sonia. Four and a half from me. I really have no idea what this means...do you? If so, please please please chime in here. I get what kombucha is. I sure as heck drink enough of it - several times a week. All them good little bacteria germies make my stomach feel gooooood, especially around these holidays and all the food that despite my best intentions I can't seem to stop cramming down. I mean, when sweatpants seem like a good daily option, it's time to cut back. 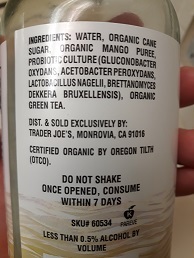 But Trader Joe's Organic Cultured Beverage? Never heard of a straight up OCB before. Comes in the same kinda glass bottle on the same refrigerated shelf as the various kombuchas TJ's offers, including under their own name. It's at the same price point (or close enough) at $2.69 locally for a pint. It comes with the same quasi Happy Fun Ball-esque handling instructions. Think the similarities end there? Nope! Similar alcoholic content (0.5% or less, meaning you don't need to be 21 to buy it). Similar sediment of funk on the bottom. You open it, it fizzies up just the same. Take a sip, of either flavor...yup, that same ol' familiar acridic fermented bacterial bite. MMM, who doesn't love the taste of gluconobacters and acetobacters and benedicto cumberbacters getting their schwerve on? For those not acquainted, the word vinegar-y is not quite right, but it's the closest I'm aware of. But, alas, after some careful discernment, there are perhaps a few differences. Alas, I am not a gastroenterological microbiologist (surprise! ), so where there may be some differences on what what microbes and how many of them, I cannot speak intelligently about them. But in comparison to regular kombuchas, the cultured beverages seem less intense, perhaps a little scaled back. 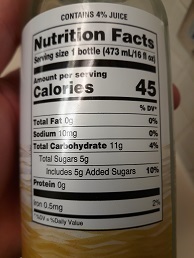 There's also lower juice content. Whereas most kombuchas I have had say they are 10% juice, the OCBs check in at 4%. So that can also play a part. My hunch, completely uncorroborated, is that the OCBs are basically a slightly watered down kombucha for those who want/need the benefits of kombucha but in lessened impact. Anecdotally speaking, for me, it works about the same and I feel about the same afterwards, and I enjoy the OCBs just as much. 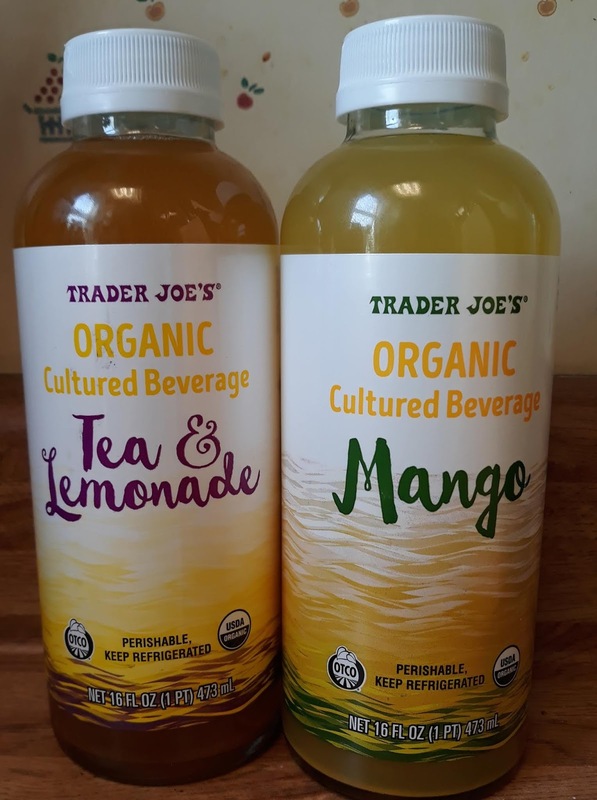 Between the two flavors TJ's currently offers, I prefer the mango over the hippie Arnold Palmer as I feel fruit lends itself better to the fermented drink genre, especially those that are sweeter like mangoes as opposed to a more subdued taste like iced tea and lemonade. Good, solid drinks, for sure. 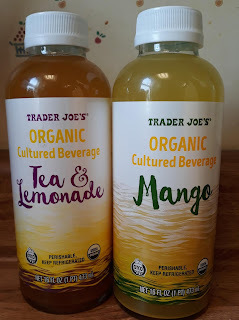 Not sure what else can be said...but if you're interested in trying them out, whether a long time kombucha drinker in search of a slight variation, or a newbie, I'd say trust your gut on this one. Double fours. You'd also note the peppermint horns. Thought he was ugly and rough. Grace the bags of Trader Joe's stuff. Won't you show your face the most?" We'll tolerate you if we must." And that, boys and girls, is how this packaging came to be. 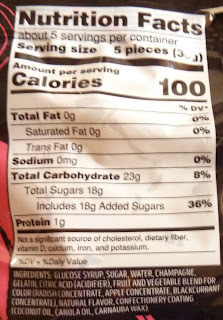 The candy on the inside of the bag is another story altogether. You can see them there in Grady's mouth. 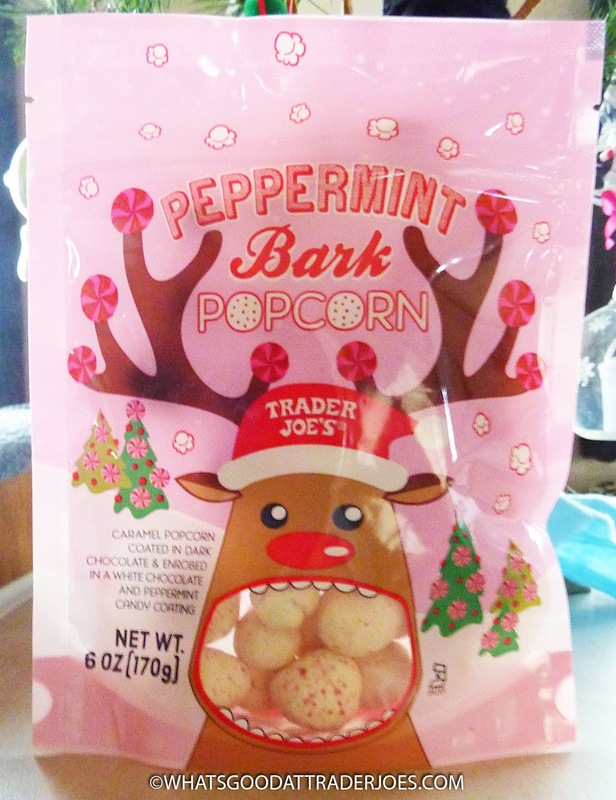 They're just popcorn pieces covered in chocolate and peppermint. They're not bad. I recommend shoveling only one at a time into your mouth. Otherwise, as Grady can attest, they're quite a mouthful. And you'll feel, quite unfortunately, the way Grady looks. What else can be said about these snacky spheres? 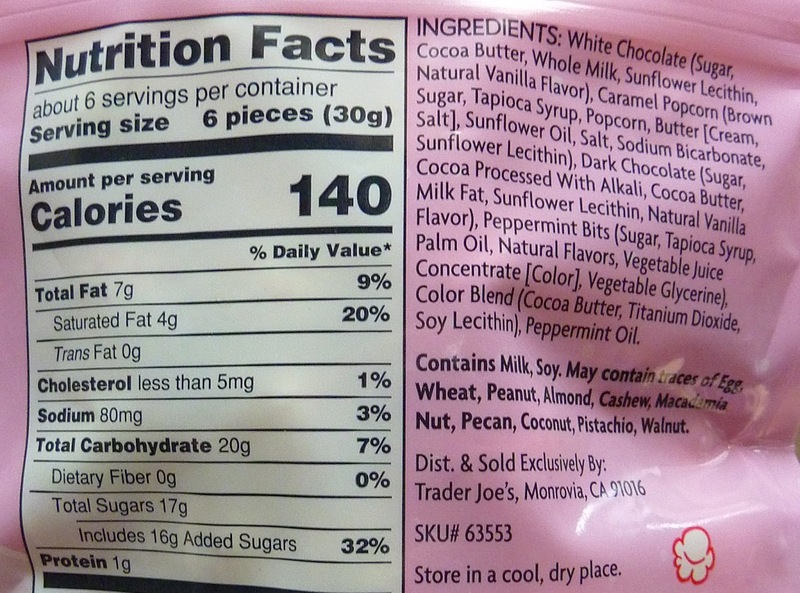 The "caramel corn" layer doesn't particularly taste or feel fresh, but that doesn't matter a whole lot since the peppermint and chocolate flavors blend so nicely with the saltiness of the popcorn. If there were some magical way to make the popcorn seem fresh-popped, we might have a real winner here. If you like peppermint bark and ever wanted it to be more salty, then this is the Yuletide snack for you. There's both dark and white chocolate in here, and that makes the overall flavor a bit more complex, since most peppermint bark I've seen is just white chocolate with peppermint bits. 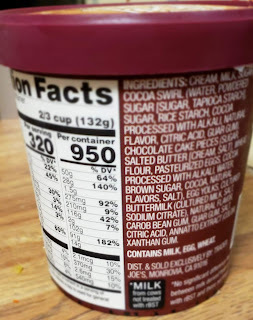 Also, there aren't really candy cane pieces in this blend. 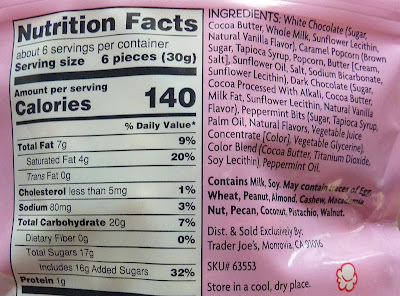 I think the peppermint just comes from the "peppermint bits" and peppermint oil. 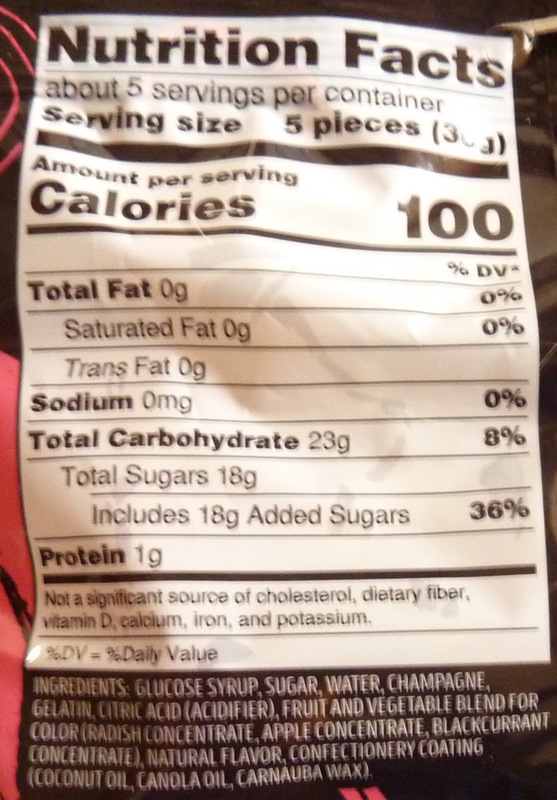 They're much finer grains of peppermint than I'm used to. Slightly more pleasant than biting down on sharp shards of candy cane, IMO. Sonia thinks they're "super pepperminty," and not in a good way, apparently. She doesn't think the popcorn flavor is prevalent enough. I agree it doesn't taste as much like "popcorn" as any of the other elements, but do think the corn provides a significant saltiness. I think if they had used regular popcorn and not caramel corn, it might have worked a little better. Sonia will be today's Grinch and bestow Grady's grains with three stars. I'll be slightly more generous with three and a half. And not that it necessarily helps make anything any better...but a yule log? Again, only a faint idea. I had to look it up. Judging by pictures, it looks like something along the lines of Swiss roll (of which I only have slightly less vague idea of what that is) or a big ol' oversized ho-ho. Now, I do know what ho-hos are...I grew up shoving them down my esophagus by the fistful. But yule logs, which is so much easier to write than its French name which translate to the same thing? Nope, never had it to my knowledge. 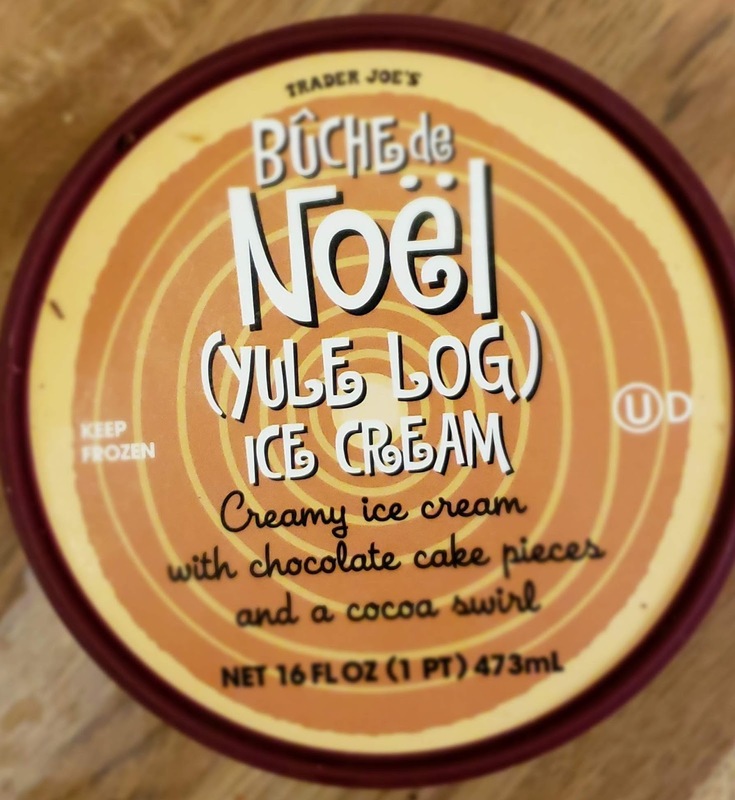 Maybe that ought to DQ me from reviewing Trader Joe's Buche de Noel Ice Cream...but it's ice cream and a lot of you on Instagram and whatnot said it was good, so I had to try it, and it was between reviewing this or a bag of carrot sticks. The reindeer can take care of those in just a couple short weeks. This TJ's Christmas-inspired ice cream seems to be a somewhat fancier take on the classic taste of cookies and creme. Except, of course this time, it's cake and cream. And to me, it falls short. Not that it's terrible stuff, as I reminded myself with a couple late night spoonfuls right now. The sweet cream base is alright, at best. Unfortunately it's slightly bland whereas, as always, I wanted something more bold for what comes down to a pretty basic ice cream flavor. It's all sorts of nondescript. And cocoa swirl? Please. There's some slightly browner areas of the ice cream, if you look at it from the right angle in the right light. It's negligable, at best. The "cake" bits are alright, though. They're plenty rich and flavorful and help pull this dessert more towards the realm of respectability. Thing is, when I taste and feel them, it's not cake that comes to mind. It's more dense like a brownie. Still, the chocolate cake is generously and amply (and if I may say so, deliciously) swirled in and about, with multiple pieces in every bite. So we got that going on. Still, and I may be speaking out of my South Pole here, I wonder if this would be better as a chocolate ice cream with sweet cream swirled in. Keep the cakey bits as is, more or less. 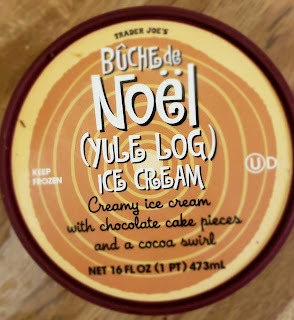 That might be more approximate of a true yule log experience in ice cream form. Both Sandy and I took a couple bites and shrugged. Maybe we're just ice cream snobs. But we're both not impressed, for much the same reasons mentioned above, and we'll not rush to return the carton by any stretch, but we're not gonna pick it up again either. Bah humbug, I guess. 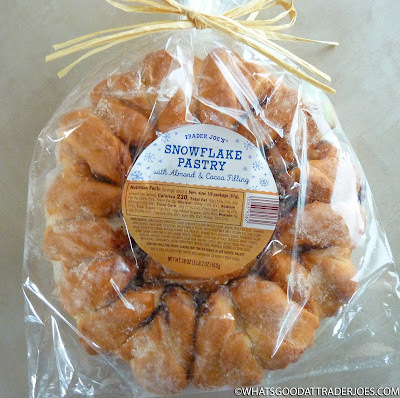 I want to say it was two Christmases ago, but Sonia and I splurged and bought one of those O & H Danish Kringles from Trader Joe's, and it was amazing. 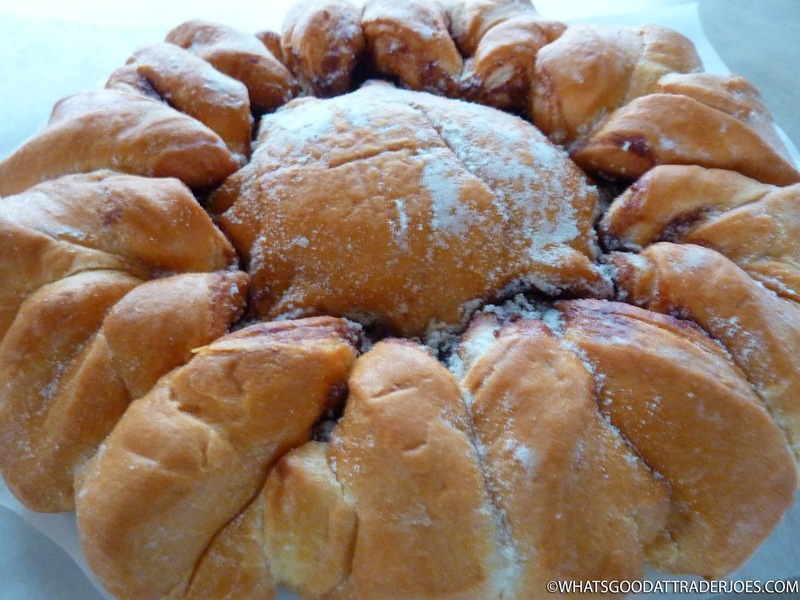 All who partook of the pastry agreed that it was divine: family, friends, guests, and pets. The decision was unanimous. Whether dunked or dry, buttered or not, that pastry was a win, no matter how you sliced it. We neglected a review on this blog since there are generally so many Trader Joe's brand goodies to be scrutinized this time of year. But with offerings like this one, TJ's is making us wish we'd picked up another Kringle instead. 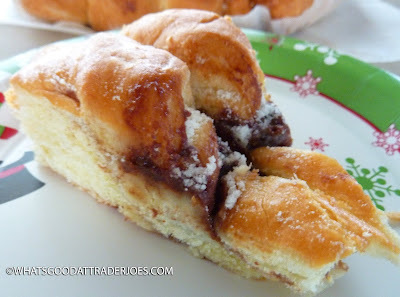 They've got the right idea: a soft bread, almond paste filling, and some sugar sprinkled on top. But the execution is poor. 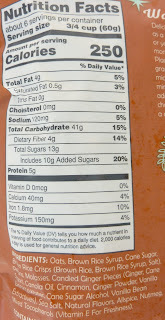 Just look at the uneven distribution of the sugar. The almond paste is severely deficient throughout the bulk of the pieces, and even the bread itself is slightly sub-par. The bites that were full of almond paste were head and shoulders better than their non-almondy counterparts, but there's simply not enough of it to go around. There's a thin ring of the stuff right where the outer lumps of bread join to the inner circle. When one snags a piece from this area, the first bite or two tends to have copious quantities of the almond paste, but after that, it's just plain old boring bread. 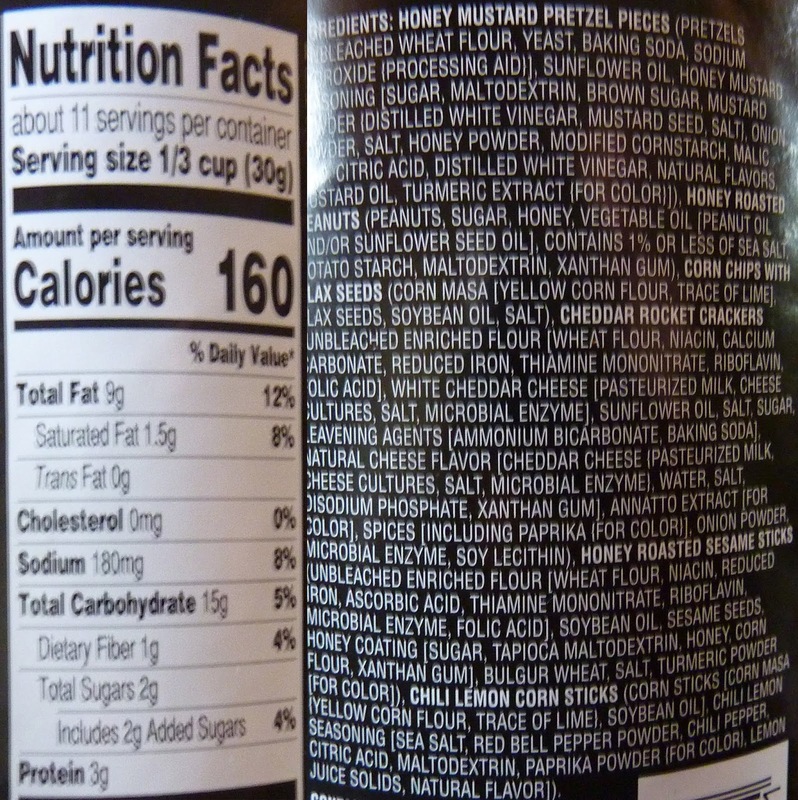 Unlike the Kringle, this product is conveniently divided into sections, making for potentially simpler servings. No knife needed. Simply tear off a slice with your hands, in the manner of a loaf of monkey bread or pull-apart cake. As you can see in the picture below, however, my better half did not trust my grubby paws and opted to slice her pieces with surgical precision anyway. The product does dunk well, absorbing a generous lot of whatever hot beverage you're sipping at the moment, but that can be said about nearly any holiday pastry, from loaves to cakes to muffins or even cookies. Heating the pastry improves both taste and texture slightly, but does not entirely redeem it. 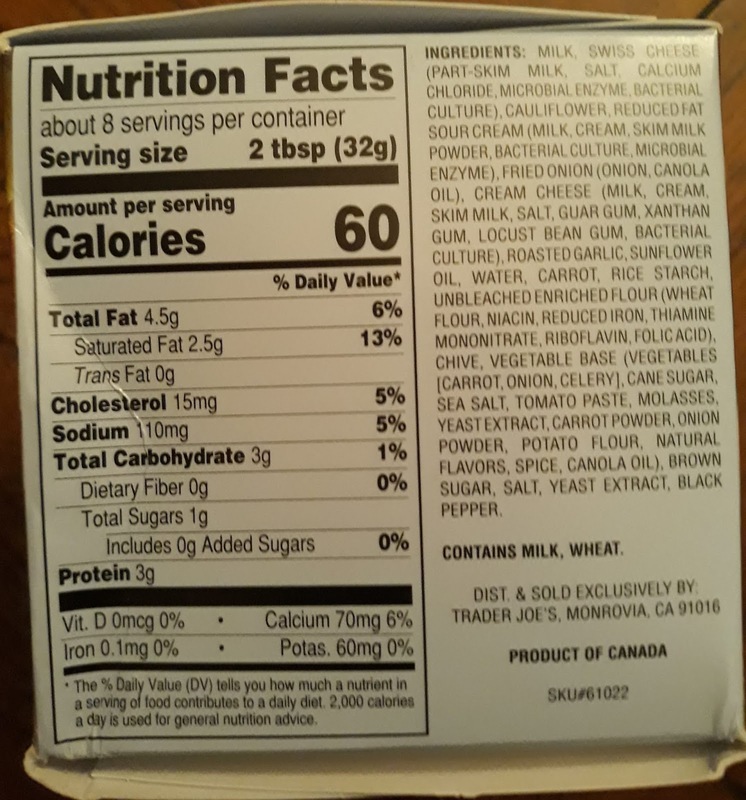 There are about nine servings in the package, according to the nutrition info, and for once, I won't argue with that assessment. $5.99 for the whole thing makes it affordable, but probably not the best way to spend six bucks at Trader Joe's this time of year. Sonia's biggest complaint was the uneven sugar and almond filling distribution, as well, but she was quite content dipping and dunking with her beloved java. Three and a half stars from her. Had the bread itself been melt-in-your-mouth delicious, it might have been worth it, but as it stands, I'll be a bit Scrooge-ish and snub this poor pastry with two and a half stars. Earlier this week when writing about the roasted cauliflower dip, I wrote that I dislike when I ate a lot of something and don't know if I like it or not. You know what else stinks? Not particularly enjoying something that it seems like everyone does. It invites too many questions. Is the product somehow defective? Did I perhaps lose some portion allotment lottery where I just so happened to receive the least choice segment that is so unlike the rest of it? Is there something wrong with me? Am I too picky? Do my taste buds work right? Do I need to see a doctor? Such as it is with Trader Joe's Mint Flavored Fudge Brownie Bar. No, I won't be shelling out any copays over it, but, man. Sandy and I picked this up to bring over to our good friends Mark and Emma's to celebrate the first night of Hanukkah. Figured between us and our kiddos we'd all really like it and it'd somehow match up pretty well with Emma's delicious homemade latkes (10 out of 10 Golden Spoons there). Dessert time! Kids devoured it, as one would expect children with anything chocolate would do. Both Sandy and Emma oohed and aahed over it. I took a bite...and was not impressed. First, the brownie portion is too small. I neglected to take a picture of the actual product but the pic on front is fairly representative. Vertically speaking, it's maybe half brownie before going into icing. I'm an icing guy. I love corner pieces of cake...but man, there needs to be something that can back that up as well. There's not enough brownie for all that rich icing, and what was there was kinda spongey. I'll give it somewhat a pass as this is a frozen product which we quick thawed in the microwave, perhaps with a different method of warming it'd turn out better. Unless my tongue somehow came down with a Paula Deen version of the Midas touch, it all just tastes like butter. Butter butter butter. Where's the mint? There's maybe a scarce hint here or there, but really, it just tastes like rich, thick buttercream slabbed up on top. The chocolate ganache does add a nice touch and for me brings the whole brownie bar back into the respectable realm, so there's that. It really needed to counteract the butteriness and pick up the brownie's slack, which it did. The ganache doesn't completely salvage the whole thing, but you'll never hear me say anything bad about ganache either. Both Sandy and Emma admitted it could have been a lot more minty which would have upped their already positive opinion. So it's not all me...they're just more forgiving and tolerable, which is a good thing for Mark and me. Both lovely ladies graced the brownie bar with similar sentiments and scores: "Damn tasty...could have been more minty...rich and delicious though," they both more or less said before plopping about a 3.5 to 4 on it each? Me? I'd go a little lower, but seeing as that I just might be the outlier here, you may take my score with a grain of sugar. 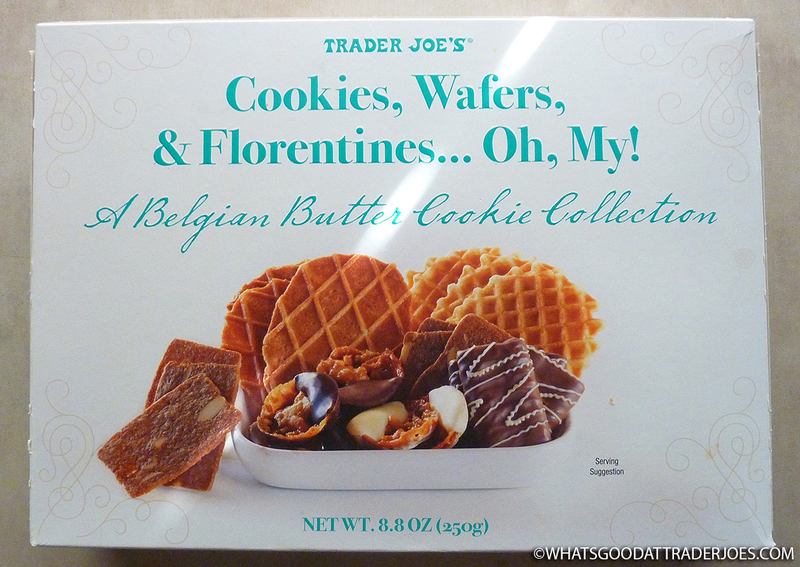 Trader Joe's Cookies, Wafers, & Florentines... Oh, My! You see, I just had some wisdom teeth extracted, and I've been out of commission for a couple days. I was pretty much out of commission for a few days leading up to the extractions because of the pain and the over-the-counter meds I was popping...at nearly double the recommended dosage. Now I'm on the mend. But my mouth is still sore. So my lovely wife helmed another video review. Since we didn't have any TJ's beverages, soups, or soft pastas on hand to look at, we just decided to keep on keepin' on with the Christmas goodies we recently acquired. This one's all her. I may circle back and leave some thoughts here in the comments in a few days after my jaw is a little less sore. Also, TJ's threw me a bone and made the very title of this product a tagline in and of itself. No creativity required on my part for that Facebook post. Good thing. My brain is still soggy. Sonia liked some cookies a little better than others. You'll have to watch the video review to find out which ones. In case they're not easy enough to read in the video, you can see the nutrition info and ingredients at this link. You can actually also buy the cookies there, too. But we don't get any commission. Even though we should. Sonia's overall final score: four out of five stars. C'mon, Sonia. You give everything four stars...<grumpy face in my direction> okay, okay. Four out of five it is. And thank you for doing this review while I recover, Sonita. Listening to the scratch and watching the smear of windshield wipers when you can't get them timed "just right" for the precipitation. Wearing wet socks. Reading something then forgetting it five minutes laster. Hitting the 0 instead of the o on the keyboard. Mild annoyances. Stuff that's not even really a deal breaker for having a good day, but something that causes a sigh and crosses your mind that you'd rather not deal with. Okay, the wet socks is probably an extreme example. That's a day killer right there. But I mentioned it with assumption that either the socks will dry quickly or a new pair will be obtained in short matter, because nobody wants to deal with that. Oh, another thing on my list: eating almost all of something and not really being sure if I liked it or not. Such as it were with Trader Joe's Creamy Roasted Cauliflower & Onion Dip. Not gonna lie: I smashed this and smashed it hard the other night during a family "snacky dinner" where had some pastry pups and veggies and chips. But did I like the dip? Tough to say. On a certain level, yes, I must have. "Creamy" is definitely the right word, and there's plenty of onion and garlic and a little herbal goodness. Still, I felt like it could use a little oomph, a little something more, like a hint of Parmesan or little more hear from some pepper. It's good, not great...I'm just glad it wasn't made ranchy. The mouthfeel though...it could be a deal breaker for some. It's not exactly chunky but it's sure not smooth, either. The cauliflower chunks are small and plenty soft without too much bite, but it ju st kinda feels a bit off, like in the same regard if not the same way as lumpy mashed potatoes. Either all chunky would be fine, or all smooth, but in the middle? Nah. 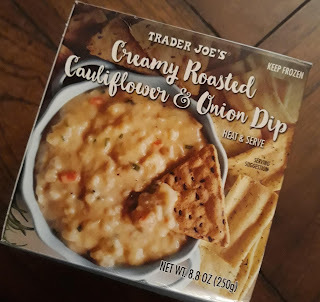 I'm not sure if this makes sense, but I'm thinking this TJ's veggie dip would be almost better as a soup somehow. Sure, it'd have to be reconfigured a bit...but this could be a really darn good soup IMHO. There's something potentially warm and earthy here which would be better expressed in soup form. In all, it's not bad, I guess. I'd much prefer the TJ's cauliflower dip as part of a holiday veggie tray over most run-of-the-mill dips, but I'm not sure I'll be going out of my way for it either. It's in the freezer section for a few bucks and needs a couple minutes in the microwave to warm on up. Not bad overall, I'd say. Definitely better than wet socks.